This magnificent basket makes a giant impression. Jaws will drop when they see the amazing assortment of fine wines and gourmet fare. 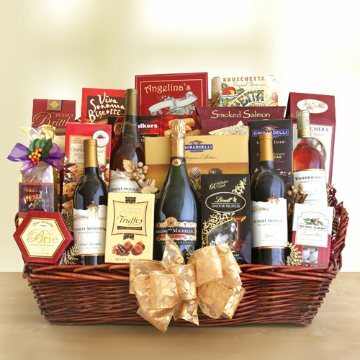 This gift basket includes the following: Four outstanding bottles of fine wine -- a Chardonnay, a Cabernet Sauvignon, a Sauvignon blanc and a Merlot -- as well as a bubbly California sparkling wine. Add peanut brittle, chocolate-dipped graham crackers, chocolate-dipped biscotti, assorted Ghirardelli chocolates, smoked salmon, shortbread, sourdough bites, chocolate truffles, cheese crisps, California almonds, Lindt chocolates, pistachios, and Moose Munch caramel popcorn. When only extravagance will do! Due to laws and regulations, this gift cannot ship to the following states: Alaska, Hawaii, Arkansas, Delaware, Kentucky, Massachusetts, Michigan, Oklahoma, Pennsylvania or Utah. Florida and Idaho have a small number of dry counties. You will receive e-mail notification, if there is a problem shipping your wine order to one of these states. Please note that this gift is only available for purchase and receipt by persons over 21 years of age. Under a rare circumstance, we reserve the right to substitute product in this gift for products of equal or greater value.